Industrialization has changed the very biochemistry of the planet. Daily our bodies are exposed to a range of perceptible and imperceptible hazards. Everyday products are comprised of a laundry list of unrecognizable chemicals. Any given human’s body fat, blood and tissues bear a similar list of chemicals, an inscribed history of his or her contact with the environment. Consumers cannot adequately analyze and assess potential threats posed by the accumulation and activity of these chemicals in their bodies. Environmental Health sciences have not caught up with the realities of ubiquitous, complex and interactive chemical exposures. Scientists and regulators are struggling to conceptualize and study how health end points like obesity, cancers, infertility and adhd are linked to gene-environment interactions that begin from the moment of conception and depend upon an individual’s unique genetic and life history. Corporate and industrial actors spreading misinformation and doubt confound the biological and social investigation of industrial hazards and make environmental health threats harder to study. As we know from work in science studies, laboratory tools are ill equipped to study the expanse of environmental health questions, even as they are being answered by our bodies, other organisms and our environments. How can exposed individuals learn to see these changes, how can a non-professional public become involved in generating knowledge about their environmental conditions? How might we build not only DIY sentinel devices but also a new public grassroots infrastructure for the discovery and analysis of pressing environmental health issues? Three years ago I graduated from Kansas State University with an undergraduate degree in general physics, got married, left home to be a Christian missionary, and I didn’t look back. I did not (and still don’t) intend to use my training in physics professionally, but I do consider science to be an important part of life that many students and even adults shy away from, because so many scientists have made the field seem untouchable to “ordinary” people. I originally came across the Public Lab project when searching for plans to make a spectrometer, as a way to measure the color temperature of a light source. What I found at Public Lab was not just instructions for a home-made spectrometer, but a group of people with a similar desire as myself: to make science accessible, understandable, and affordable for ordinary people. While a spectrometer can be used for so many different purposes, one of the most well-known is to determine the composition substance by the way light interacts with it. Not only can a spectrometer help to identify a substance by looking at what light is emitted from it, but also by looking at what light it absorbs. I used my home-made spectrometer to do both of these in an experiment using ultraviolet light fluorescence. For many substances, UV light has enough energy that the substance will absorb it, then emit some extra energy in the form of a lower energy photon. Laboratory spectrometers can cost thousands of dollars, but the components required to make a basic one are inexpensive and commonly available. When he searched through the spectrometry tool page on Public Lab’s website, Josh found video instructionals, written explanations, photo documentation and a parts list that enabled him to build his own spectrometer. He also joined the active listserv to find out about what others working on the spectrometry tool were doing. Through Public Lab’s website, an evolving framework for collaborative open source hardware development, Josh could become part of community building this tool and share the results of his work. The spectra he recorded were uploaded to Public Lab through open source free software – Spectral Workbench. This software allowed Josh to share, align and analyze his spectra with other members. By enabling new approaches such as open hardware development for developing environmental health research tools, Public Lab acts as an infrastructure for DIY sentinel devices. Josh’s home spectrometry set up. For more info on the setup, see Public Lab research note: Setup for UV Testing with Spectrometer. Josh’s results analyzed in Spectral Workbench. Compare the first image in the set, showing just UV light, to the fifth image in the set. 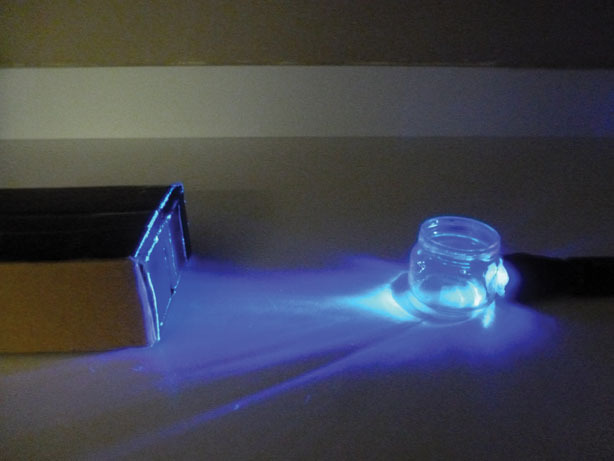 Image five shows the UV light being absorbed by the “All Free and Clear Detergent” and resultant emission of blue light. This illustrates the presence of brighteners. From top: 1) 393nm UV; 2) 393nm UV through tap water; 3) 393nm UV through Clorox bleach; 4) 393nm UV through homemade detergent; 5) 393nm UV through Seventh Generation Free and Clear Detergent; 6) 393nm UV through All Free and Clear Detergent. After Josh successfully built his spectrometer with help from the online community at Public Lab, he began to participate in activities known among Public Lab’s members as “Civic Technoscience”. Performed by individual members of the public to investigate questions of importance to their daily life (Fortun and Fortun 2005), Civic Technoscience is a mode of science that enables people to become credible generators of new knowledge about their environments and conditions using tools they can understand, build and adapt themselves (Wylie et. al forthcoming). For Josh, this meant he became a contributor by submitting “research notes” on wiki-pages describing his experiences assembling spectrometers and detailing his findings. His research is a kind of “hello world experiment” that shows the spectrometer might support new forms of consumer activism and environmental investigation of hazards that have traditionally have been hard to see and study. Brighteners are in many ways a quintessential example of such an imperceptible hazard: a product of industrial chemistry, this ubiquitous consumer good gives clothes the appearance of cleanliness by coating them in chemicals. While Josh became interested in brighteners because he noticed they reduced water absorbency in his child’s diapers, others, also drawing on personal experiences, have expressed concerns about their potential harm as allergens. Research from the 1970s indicates that optical brighteners can cause contact dermatitis – including rashes and irritation – when mixing with sweat and absorbing into skin (Osmundsen 1969, Osmundsen and Alani 1971). However, more recent scientific studies contest those findings (Belsito 2002). Consumers, through the work of concerned individuals like Josh, operating homemade tools such as the spectrometer and Public Lab, could collectively investigate and archive claims that detergents are “free and clear” and potentially the elucidate links between brighteners and dermatitis at a grassroots level. Public Lab is working towards building a public archive containing spectra from thousands of such individual investigations into the contents of common household and enable collective civic inquiries to identify and campaign against a range of unsafe consumer products. To this end, Public Lab launched the Spectral Challenge in March 2013, a crowdfunded, public competition to improve the process for open source spectrometry and develop real-world use cases like Josh’s. How might individual investigations be connected to new forms of environmental health advocacy aiming to reshape industrial infrastructures? A second Public Lab project investigates how civic technoscience might document and help mobilize action against a by-product associated with natural gas extraction-Hydrogen Sulfide (H2S). In September of 2011, Public Laboratory members met with residents of Garfield County, Colorado who had recently organized to sample one family’s indoor air quality because of the smells coming from their tap water. Analysis of the sample showed H2S levels of more than 185 times above EPA’s recommended long-term exposure level. The family, in which the son developed painful skin lesions coincident with this exposure, was forced to abandon their home. Neighboring gas development companies denied that nearby natural gas extraction operations were connected to the water contamination (Colson 2011, GCM 2011). The environmental health manager for the county responded to these reports by saying that the neighboring gas wells had been “closed in” and could not be the source of the H2S (Colson 2011). H2S, which smells like rotten eggs, can readily be detected by humans at very low concentrations. But as the case above shows, concerned people can struggle to determine the source of H2S contamination. To help communities who smell H2S map the source, Public Lab is adapting a method developed by a volcanologist who studies the sources of the smelly gas (Horwell 2004,et al., Horwell et al. 2005). Their method uses photographic paper which tarnishes (turning brown after oxidizing) when its silver halide (the photo responsive element) is exposed to H2S. Compared to commercial meters that cost a few hundred dollars and are difficult for non-professionals to use, the test Public Lab is developing, utilizing film canisters that prevent light exposure but allow air circulation, only costs a few cents a test and can easily test multiple sites simultaneously. I became interested in issues surrounding natural gas drilling a few years ago when the massive drilling of the Marcellus Shale began near my home in Pennsylvania. I remember going to a conference at Temple University where a panel of scientists, activists and political leaders talked about this issue. I left outraged, it was as if they were all speaking different languages. The scientists were brilliant and had all the tools to predict what would happen, but held no opinion on those predictions and could not communicate them to the public. The activists were in constant attack mode and could not listen and the politicians would only defend their own actions. I was excited to find out about Public Laboratory while pursuing my graduate degree at Rhode Island School of Design. The Public Lab research group at risd was just beginning to create a DIY test that could register the presence of H2S (a toxic bi-product of natural gas drilling) in the air. The test would use regular photo paper prepared in a certain way, allowing it to be exposed to the air. Over the next few months, we made the test strips from photo paper and containers to place the strips in. We tested the difference in light exposure for each container. We read papers on the various methods of testing H2S that were already being used by scientists in field research and adapted them to suit our needs, and met with a local air-quality testing expert. Field experiments like Megan’s are a novel attempt to redress the gap between landowner’s perceptions of a hazardous smell and scientific evidence required by regulators. As Megan’s results illustrate, the degree of darkening of the photopaper is easily readable by non-experts and could be arranged as a map to make sources of H2S smell evident to regulatory audiences (Horwell et al. 2005). The investigations undertaken by Megan and Josh show how citizens are attempting to harness technology to respond to many contemporary hazards that have remained imperceptible due to a lack of available research tools, misinformation and regulatory disinterest. Public Lab provides a collaborative space where individuals from all sorts of backgrounds can collaborate to generate research tools, methods, and case studies of their environments, in order to help those who are negatively impacted by hazards of industrial life on a daily basis make these threats perceptible and actionable. The fluorescent properties of brighteners has also been used by Seventh Generation, an ecologically friendly detergent company, as part of a social media campaign to encourage people to discover for themselves reasons for switching brands. This campaign asked people to submit images of clothes glowing under black light due to brighteners (Newman 2010). 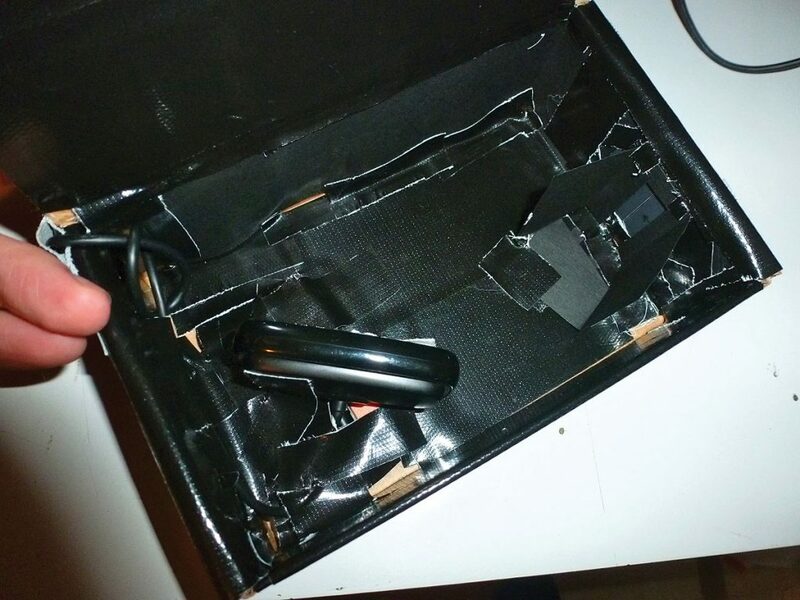 Josh’s DIY spectrometry case differs in providing data in an authoritative format, the spectra, which might conceivably be used to identify exactly what chemical brightener is being used in this “free and clear” product. This blog illustrates patient activism around optical brighteners in detergents. Belsito, Donald. V., et al. 2002. “Allergic contact dermatitis to detergents: a multicenter study to assess prevalence.” Journal of the American Academy of Dermatology, 46(2):200- 6. Calnan, C. D. 1973. “Hazards of optic bleachers.” Transactions of the St. Johns Hospital Dermatolgy Society. 59(2):275-82. Colson, John. 2011. “Report: Hydrogen sulfide detected in air at Silt Mesa; Health official, industry doubt findings are true.” Post Independent, July 14. Fortun, Kim and Michael Fortun. 2005. “Scientific Imaginaries and Ethical Plateaus in Contemporary U.S. Toxicology.” American Anthropologist, 107(1): 43-54. Ganz, Charles. R. et al. 1975. “Accumulation and elimination studies of four detergent fluorescent whitening agents in bluegill (Lepomis macrochirus).” Environmental Science & Technology, 9: 738-744. Global Community Monitor. 2011. “Gassed! Citizen Investigation of Toxic Air Pollution from Natural Gas Development.” Global Community Monitor, July 12. Horwell, Claire J. et al. 2004. “Evaluation of a simple passive sampling technique for monitoring volcanogenic hydrogen sulphide.” Journal of Environmental Monitoring 6(7): 630-635. Horwell, Claire J. et al. 2005. “Monitoring and mapping of hydrogen sulphide emissions across an active geothermal field: Rotorua, New Zealand.” Journal of Volcanology and Geothermal Research, 139(3-4):259-269. Newman, Andrew. 2010. “Seventh Generation Highlights Its Chemical Free Detergent” New York Times. December 29. Osmundsen, P. E. 1969. “Contact dermatitis due to an optical whitener in washing products.” British Journal of Dermatology 81(11): 799-803. Osmundsen, P. E. and M.D Alani. 1971. “Contact allergy to an optical whitener, “CPY”, in washing powders.” British Journal of Dermatology, 85(1):61-6. Rowe, Helen. D. 2006. “Detergents, clothing and the consumer with sensitive skin.” International Journal of Consumer Studies, 30(4): 369-377. Sanchez-Meza, Juan-Carlos et al. 2007. “Toxicity assessment of a complex industrial wastewater using aquatic and terrestrial bioassays Daphnia pules and Lactuca sativa.” Journal of Environmental Science & Health 42(10):1425-1431. Sturm, R. N, K. E. Williams, and K. J. Macek. 1975. “Fluorescent whitening agents: Acute fish toxicity and accumulation studies.” Water Research, 9(2):211-219. Wylie, Sarah, Jailbert, S. K. Dosemagen, and Matt Ratto. Forthcoming. “Institutions for Civic Technoscience: How Critical Making is Transforming Environmental Research.” Information Society Special Issue on Critical Making, Wylie S, Jailbert K. and Ratto M. Eds.